37 – There have been 37 MotoGP races without a winner from the USA, since Ben Spies won at the Dutch TT in 2011. 32 years – On the first day of practice at the Indianapolis Grand Prix it will be exactly 32 years since Barry Sheene won the 500 Swedish GP at Anderstorp. This was the last time a British rider won a Grand Prix in the premier class. 29 – The victory by Marc Marquez at Laguna Seca was the 29th time that he had stood on the top step of the podium in Grand Prix racing – the same number of GP victories as Loris Capirossi achieved throughout his career. Another victory for Marquez will put him level in terms of GP wins with three-time 125 World Champion Luigi Taveri. 27 – There have been 27 MotoGP races without a rider from the USA finishing on the podium, since Ben Spies finished second at the final race of 2011 in Valencia. This is the longest sequence without a USA rider finishing on the podium in the premier class of GP racing since Kenny Roberts Jr. ended a run of 33 races at the first race of 1999, in Malaysia. 17 years – On race day at the Indianapolis Grand Prix it will be exactly 17 years since Alex Criville beat Mick Doohan at the 1996 Czech GP by just 0.002 seconds. This was the closest ever recorded finish to a 500 GP since the introduction of electronic timing in 1990 which was capable of measuring times to one thousands of a second. 8 – Both Luis Salom and Maverick Viñales have been on the podium at the opening eight races of the year. In the 65-year history of Grand Prix racing, only one rider has had a longer sequence of podium finishes from the start of the season in the Moto3/125 class; this was now team owner Fausto Gresini, who won the opening ten of the eleven 125 class races in the 1987 season. 7 – The last seven MotoGP races in the USA have been won by Honda riders. The last non-Honda MotoGP winner in the USA was Jorge Lorenzo, riding a Yamaha at Laguna Seca in 2010. 5 years – On the day of qualifying at the Indianapolis GP it will be exactly five years since Stefan Bradl won the 125 race at the 2008 Czech GP, to become the sixth son of a Grand Prix winner to also take a GP win. 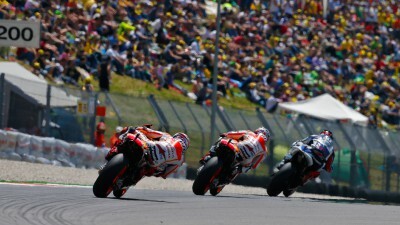 3 – Honda riders have won the MotoGP race at Indianapolis for the last three years. 3 - Indianapolis is one of just three current circuits on which Jorge Lorenzo has not started from pole in any of the Grand Prix classes; the other two are Austin and Valencia. 2 – Marc Marquez has won both races to have taken place so far in the USA in 2013. If he also wins at Indianapolis, he will become only the third rider of all-time to win three premier class GP races in the same country in a single season. The other riders to have done this are Jorge Lorenzo (Jerez, Barcelona and Valencia in 2010) and Casey Stoner (Barcelona, Aragon and Valencia in 2011), meaning in both cases the three wins apiece were all collected in Spain. 1 - With Aleix Espargaro failing to add to his points total at the US GP, the only rider who has scored points in all of the first nine races of the year is Andrea Dovizioso.